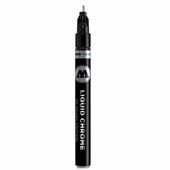 MOLOTOW LIQUID CHROME 4mm Marker Elevate your sketchbook sessions with our new Molotow Liquid Chrome Markers! 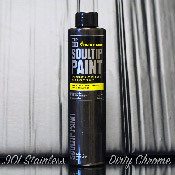 This innovative new formula offers the ultimate in super metallic pigment and mirror shine in a handy pump tip pen. Pair them with our Black Books for a bold pop of silver. Available in 1mm, 2mm and 4mm nibs. 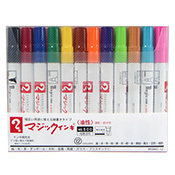 Great for drawing, sketching, model painting, glass art and more. Refillable with replaceable nib. (699.010 Caliigraphy 2-5mm). 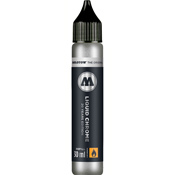 Elevate your sketchbook sessions with our new Molotow Liquid Chrome Markers! This innovative new formula offers the ultimate in super metallic pigment and mirror shine in a handy pump tip pen. Pair them with our Black Books for a bold pop of silver. Available in 1mm, 2mm and 4mm nibs. 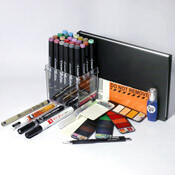 Great for drawing, sketching, model painting, glass art and more. Refillable with replaceable nib. (699.010 Caliigraphy 2-5mm). 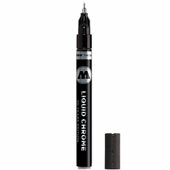 I purchased this marker for use on model car/truck kits, and they are friggin' incredible! The 4mm width is great for larger areas like bumpers and suspension components, but I have done window trim with mine also, it's all about learning to control the marker. Much, much easier than 3-4 hours spent doing foil work, so I'm sold! I will be buying these for as long as they're on the market! 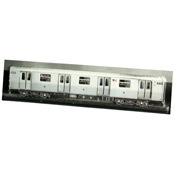 This product was added to our catalog on Tuesday October 25, 2016.